World production of cotton will not increase much anymore, I read several times recently – mainly as the result of its large water requirements. Whereas we know for sure that global demand for fibres for clothing will continue to increase, primarily because of growing affluence. So we might well ask: how will a reasonably affluent 9 or 10 billion pop world clothe itself by 2050? This is the first in a series of articles on fibres of the future. The articles were published on 31 May and 19 June. Cotton is by far the most widely used natural fibre for clothing and household textiles. Global production amounts to ca. 25 million tons, four times as much as in 1950. 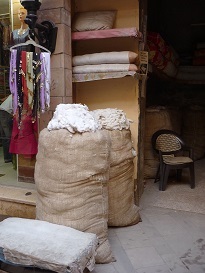 It dwarfs all other natural fibres, taking a share of about 80% in total natural fibre production (the remaining 20% being shared by wool, linen (flax), hemp and others; natural fibres like jute, coir and sisal are also much in use, mainly for industrial purposes such as flooring and upholstery). Both the area planted with cotton and the productivity of the land have increased continually, but both processes now almost have come to a standstill. On the other hand, production and use of man-made fibres rises continually, reaching a volume of 63 million tons in 2014, of which the vast majority is a multitude of polyesters. In our quest for the fibres of the future, we will first have to dig into the popularity of cotton: why are all our T-shirts and jeans still made of it? And then look into the factors that limit the production, before considering alternatives. Cotton is popular because it combines some very important characteristics, according to the International Forum for Cotton Promotion. It is a good conductor of heat. In other words, it draws heat away from the skin and keeps one cool, making it comfortable to wear. It is very soft, making it an ideal material for underwear. It does not cause static electricity. Cotton can be easily dyed with various colours. It absorbs moisture easily and can take up to one fifth of its weight in water before it feels damp. Therefore, it absorbs body moisture and evaporates it to the surrounding air, thus allowing the body its natural tendency to breathe – keeping one cool in summer and dry and warm in winter. But all applications facilitated by these characteristics are under attack of man-made fibres. For instance, the past decade has seen the rapid advent of polyesters in sportswear – very much the area that is about absorption and quick transmission of water. The key to this new field of application is that modern machines can spin very fine threads. 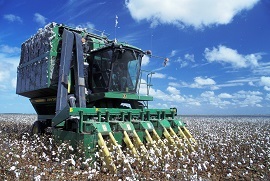 Cotton production has many environmental effects. The plant, indigenous in hot, subtropical regions around the world, requires much water (most varieties are quite drought resistant, but production falls sharply in dry conditions). Therefore, if the crop is grown in arid areas, it requires irrigation. This has put a heavy strain on water resources in countries as wide apart as Uzbekistan, Pakistan and Australia. The Soviet attempt to explore the benefits of this ‘white gold’ caused the virtual disappearance of the Aral Sea (once the world’s fourth inland sea) from 1960 onwards – although this temporarily turned Uzbekistan into the world’s largest cotton exporting country. According to WWF, an average of 8506 litres of water (irrigation and rainfall) is required to produce 1 kg of cotton lint; with a range of 4710 lt/kg (China) to 20217 lt/kg (India) (1). Often, the efficiency of water use is low. Much water will run off, unused. Drip irrigation that might lead to much higher water efficiency is virtually non-existent. On top of that, this crop is susceptible to many diseases and attack from pests. In the past century therefore, cotton production required treatment with a large number of pesticides – to such a level that health conditions of many farmers and their families deteriorated (partly because of incompetent or mistaken use of toxic substances). On an area of 2.5% of the world’s arable land, cotton is estimated to be responsible for 6% of global pesticide use (2). In recent years however, the level of pesticide use has fallen, partly because of better education, partly because of the application of genetic engineering. In Bt cotton, now the predominant variety in India, China and the US, genes have been inserted through which plants become toxic to some of its most nasty pests; and this reduces the need for pesticides. However, genetic engineering is not a magic tool: as resistance of pests to Bt cotton surfaces in some areas, there is a need for new engineered varieties. All in all, cotton is not an innocent crop. But production methods can improve considerably. Organic cotton is still produced, pockets of it have survived, predominantly in areas not very susceptible to pests and in regions where poor farmers cannot afford to buy artificial fertilisers and pesticides. Organic cotton needs a premium price paid by the customer, as yields are generally lower; but at present production exceeds demand, and therefore about a third of it is sold as ordinary cotton which reduces the incentive for farmers. Much more impact however will come from the Better Cotton Initiative. This organisation unites producers, manufacturers, global brands and NGOs and was founded in 2009. BCI promotes responsible agriculture. Its ‘standard system’ covers all three pillars of sustainability: environmental, social and economic. 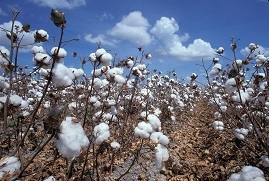 As it says on its website: ‘Each of the elements – from the production principles and criteria to the monitoring mechanisms which show results and impact – work together to support the Better Cotton Standard System, and the credibility of Better Cotton and BCI.’ BCI practices differ from country to country, depending on the needs and possibilities. A lot of effort goes into education of the farmers, in order to prevent inadvertent use of pesticides and to improve the efficiency of water use. But although some of the world’s major retailers like IKEA, H&M and C&A support BCI, here too demand falls short of production – dramatically by about 80%. That needs to be redressed: more retailers should embrace responsible practices and require their suppliers to use better cotton for their products. In short: cotton remains by far the most important natural fibre. For many applications, it has superior characteristics. But its future is challenged from the inside by unsustainable production methods, and from the outside by synthetic fibres. In subsequent articles we will dig into the questions which other natural fibres might substitute cotton, and to what extent synthetic fibres will continue to be increasingly used. (1) (2) Cleaner, greener cotton. Impacts and better management practices. WWF report, kindly supplied by Mr Richard Holland.